Fallen return in Diablo III, in a familiar form. Though they remain small, cowardly, impish little demons, they have been upgraded in appearance and tactics. Their strength is also bolstered by more powerful chieftan units, and the Shaman and Champion types can whip the common Fallen into a murderous assault force. 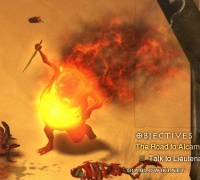 Overseers were seen in action in the BlizzCon 2009 demo build. They act as battle commanders; they are the largest type of Fallen and the fiercest melee attacker, but they're most noticeable for their ability to cast a warcry that affects all Fallen Imps in range, enraging them and altering their AI to make them fearsome attackers who will not flee when they witness the death of one of their fellows. Besides their warcry abilities, Overseers are formidable attackers in their own right, armed with long staves to which they have crudely-affixed a pair of blunt swords. Overseers have a slow attack rate, thanks to their improvised polearms, but their vicious swings pack heavy damage for players not quick enough to avoid the fairly slow attacks. Physical melee attack with spiked club. When one of their number is killed they run away so a pack of them can be frustrating for the melee fighter. The Fallen Hound is an attack beast and can be found in large packs of Fallen, often protecting Fallen Shaman, and they are the strongest of the Fallen melee units. They look a bit like hyenas, more than being dog-like. Physical melee attack. These guys are like sticky tape and won't get off you until you or they are dead and as they travel in packs, as you'd expect, it can become dangerous very quickly. Don't leave it too long to retreat because even when you do they'll be nipping at your heals. Fallen Lunatics are shock troops, bound to die in melee combat while fighting for the honor of their tribe. They possess a melee attack as well as an explosive, suicidal assault. The lunatics are a bit like the Explosive Minions seen in Diablo II. Lunatics are suicidal and explosive, but they hold their daggers up, Psycho-style, as though they're rushing in to stab the hero, rather than stab themselves. They attack initially, and will go suicidal after a short time in proximity to a hero or a follower. Lunatics do have a low-damage melee attack, but they do not frequently get the chance to display them. They are low on health, but they come in large numbers, which can be troublesome as they sift through an elite melee group or otherwise sneak up on the player. The lunatics are able to "prime" their suicide attack when the player is on the other side of a door, exploding almost immediately upon opening the door, even though the player had no idea they were there. Overall, if a player is using reticence and taking in their surroundings, the lunatics won't pose a danger, unless they're allowed to get too close. Lunatic Explosion can be deadly especially in numbers. The Lunatic will run very fast towards the player and explodes when he reaches him. They are usually in packs and just a few can easily finish off a player. A ranged attack is needed but they can be outrun, after about 10 seconds of charging at the player they'll detonate anyway so if all else fails, run. Fallen is in some way involved in the following achievement(s). Fireball conjures up fireballs to throw from range. Resurrect Fallen, as the name suggests means this guy can bring nearby fallen grunts back to life so dispatch him first. During the Monster and Art panel at BlizzCon 2009, a slide was shown with the silhouettes of various Fallen. The Imp, Hound, Shaman, Overseer, and Lunatic are easily recognizable, but what's the reclining blob in the center? Many fans assumed it represented a "Fallen Queen" since there have long been joking references made to "where do all the little Fallen come from if they're all male?" However, the only monster who seems to match that silhouette in the final game is the Blood Clan Occultist, who is not a Fallen but a type of Khazra (Goatman). Adding to the mystery is a piece of concept art revealed during a Blizzcon 2008 panel, which shows a monster that could only be the Fallen Queen; a creature that is not seen in D3C. Perhaps she'll be added in one of the expansions? The fallen are true demonic warriors with a formerly proud past. The historian and loremaster Abd al-Hazir has done extensive research about them. The reason so much research must be made is because during the Mage Clan Wars, many horrible things were done by the Vizjerei clan, and they tried to whitewash many of these in their literature. One example is the Khazra, who were not at all demonic. Abd al-Hazir has spent enough time with ancient lore tomes to be more or less certain the story about the Fallen Ones described in Demonicus de Zoltun Kulle at least is true, with one difference: They served as Azmodan's hands, performing acts that he would not, could not involve himself in. They were once exalted demons of the Burning Hells, and are now called Fallen Ones, or classified as "Nanus Improbus". However, they were never lieutenants of Baal, like the Vizjerei Chief Librarian Vischar Orous claimed. The first time the Lesser Evils tried to overthrow the Prime, the ancestors of today's Fallen failed in their attempt and received Diablo's full wrath, twisted into small, ridiculous imps in contrast to their previously powerful forms. Azmodan did not return their former glory as he felt it was their fault he filed. Despite that their failure helped Azmodan gain the information needed to later overthrow the Prime Evils into the Dark Exile, he still did not change his mind about the Fallen. Some 20 years ago, these beasts were originally sighted near civilized lands, wrecking havoc around the country side. This was also the first time the Fallen Shaman were seen with the imps, supporting them with magical spells as well as resurrecting them from the dead. Carvers and Dark Ones, tougher cousins of the Fallen were also seen, indicating the Prime Evils had a strong connection with the mortal plane, for those wise enough to realize that. In Abd's research he has found proof of many more breeds of Fallen than previously thought existed, including Imps, Shamen, Hounds, Lunatics, Overseers and at least two more types. 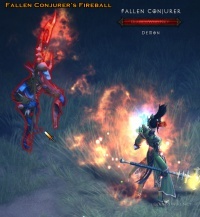 Fallen debuted in Diablo I. See their page in the Diablo I Wiki for more details. In that game they were simple little enemies, memorable chiefly for their annoying AI and swarming behavior. The Diablo II Fallen are very similar to the first game's little demons. They are slightly different in that they wear more clothes, and use a wider variety of tools, but they all have the same basic behaviour, which is milling about, attacking the player and running away if they see a friend get killed. They no longer use "War Cry Mode", but they have Diablo II Fallen Shamans that can resurrect them with a little waving of their staves. Blizzard also introduced the Fallen personalities, Bishibosh, Rakanishu and Colenzo the Annihilator, implying a sort of somewhat sophisticated culture. 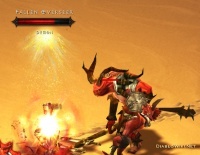 The Diablo 3 developers knew that the Fallen type monster would be returning very early in their development cycle, though they did not reveal the Fallen until early 2009, nearly a year after the game's announcement. More information about them was released in 2009, at Blizzcon and then later that year on the official Diablo 3 site. Mega spawn of Fallen, from early development days. Hounds protecting Shamans in the Act 2 desert. The development and design of the Fallen is covered in the first 3:30 of this video of the Monster and Art Design panel from BlizzCon 2009. Blizzard produced a short film showing the various known types of Fallen, when their coverage debuted on the official Diablo 3 site. This page was last edited on 15 April 2016, at 17:14.